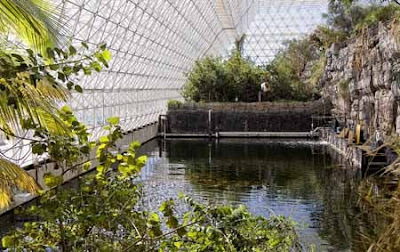 I have yet to visit the Biosphere II in Tucson, AZ and managed by the U of A. I actually am not sure if it's open to the public so I might need to look into that before I show up. The Tucson Weekly had a nice article about the Biosphere and how it is being used for climate-change research now instead of the original plans for the enclosed structure (which involved locking people in and forcing them to live off what they grew within the sphere?!). I'm glad they are able to put the structure to some research use! The scientists will be investigating the effect of climate change on water flow through soil systems. It sounds like a giant terrarium will be a great resource for that experiment! They've cleared out the biome where Biospherians once grew their crops, and the now-bare concrete floor will soon be covered by experimental hillsides to better understand how water moves through the earth from mountains to rivers, says John Adams, Biosphere 2's assistant director for planning and facilities. Once three hillsides have been created, researchers will pour rain onto them and use sensors to measure the movement of the water. After taking those measurements for a few years, they'll add vegetation and eventually start adjusting temperatures and CO2 levels. "This will be an experiment that will be 10 years or longer, and you've got people who are soil scientists; you've got plant physiologists; you've got people who put together all these models and predictions of how things may or may not change if temperatures rise or CO2 levels increase," says Adams. It's funny, that I went to Tucson twice and never visited the Biosphere how dumb of me! But I might go next year, we have friends that live there. Thanks for stopping by my blog. I love your blog and am going to add it to my feeds. Thanks again.